Taking full advantage of the Eddie Murphy comeback that is theoretically happening, Eddie Murphy sat down with Rolling Stone to declare that his days of starring in family movies are over, and not a decade too soon. “I don’t have any interest in that right now,” Murphy said by way of explaining that these days he’s content to just stay in his “beautiful house” that all those family movies paid for. “There's really no blueprint,” he said of his choosier career motivations, “but I'm trying to do some edgy stuff.” Edgy stuff like, for example, hosting the Oscars, plus pushing for another continuation of his Beverly Hills Cop franchise, which Murphy has since abandoned pursuing as a return to its R-rated feature film roots and instead begun prepping as a TV show about, um, family. 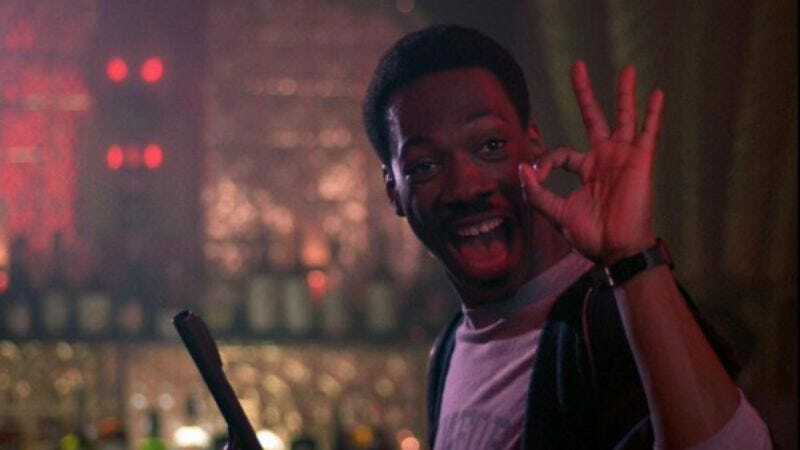 “What I'm trying to do now is produce a TV show starring Axel Foley's son, and Axel is the chief of police now in Detroit,” Murphy said of this new, edgy stuff he’s been thinking about, adding that he would appear in the pilot and “show up here and there.” Murphy then continued, apparently without listening to the words he was saying and what they meant, “None of the movie scripts were right; it was trying to force the premise. If you have to force something, you shouldn't be doing it. It was always a rehash of the old thing. It was always wrong." Murphy then mused aloud that there was nothing worse in this world than animal cruelty while absentmindedly strangling a kitten.